Nestle announced the Butterfinger Super Bowl 50 ad in December. Today the brand kicked off the supporting campaign for the Super Bowl Ad under the slogan Bolder than Bold. 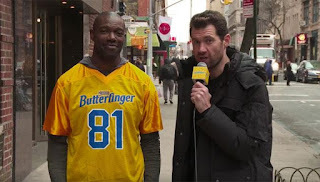 In a 4 minute video former NFL player Terrell Owens and comedian Billy Eichner take to the streets on New York to ask people to perform a bold touchdown dance. Terrell Owens was known for crazy touchdown dances. Butterfinger actually wants us to treat to some hot touchdown dances in the Super Bowl game. Butterfinger is offering pro football players up to $50,000 for any fines the may incur for excessive celebrating after a touchdown in one of the three final games of the season. This is a bold offer! Billy Eichner is hilarious in impromptu street interviews asking people to be bold. Watch below. The above video has likely not much to do with the Butterfinger Super Bowl 50 ad. It will have the Bolder Than Bold theme, but how the ad will communicate that remains to be seen. The Butterfinger candy bar was originally invented by Chicago’s Curtiss Candy Company was believed to have been promoted as early as 1923. Nestle bought Butterfinger in 1990.